Google announced Project Stream earlier today. Google Stream will allow users to stream video games from the cloud to systems using the Chrome internet browser. Assassin’s Creed Odyssey will be the first game available on the service, which begins a beta test on October 5. The service was detailed in a Google’s blog post. Applications for the beta test for Project Stream are now available, but require that users have a connection speed of at least 25 megabits per second. The post described Project Stream as “a technical test to solve some of the biggest challenges of streaming.” The post said that a blockbuster video game is the crux of that challenge. Project Stream has been in development for years — it was previously known as Yeti — and today’s announcement has given it a slightly more official name. The goals of Google Stream are to reduce latency between user inputs and the game’s response, and to present the highest quality graphics the game can offer at the same time. Other game streaming services like PlayStation Now have consistently battled with issues of latency and video compression. Infrastructure has been a significant issue for cloud gaming services such as Project Stream. Disparities in connection speeds, and fluctuating stability have made many of these services difficult propositions for end users. Google’s internal infrastructure for sites like YouTube will likely be put to use by Project Stream. The company has also put time into being an internet service provider with Google Fiber. Project Stream is facing increased competition from other services, even in its infancy. PlayStation Now and Xbox Game Pass are two subscription services that allow users to download available games. While PS Now is also a cloud gaming service, the model employed by Game Pass allows players to choose from a variety of games and install them on their system. PS Now recently added the ability to download PS4 and PS2 titles. This method bypasses the issues associated with cloud gaming. 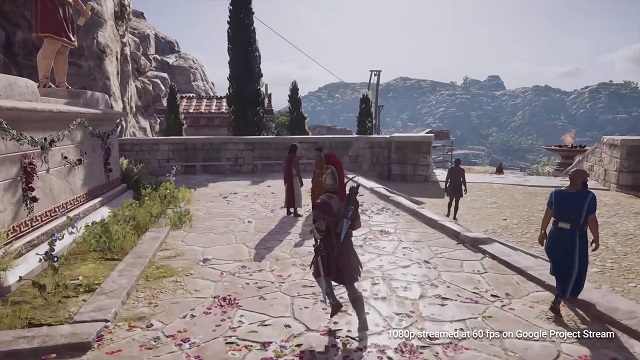 Google Stream’s mission, meanwhile, is to allow any personal computer user to play games like Assassin’s Creed Odyssey through its cloud gaming service. However, other major questions remain about Google Stream. What is the pricing model? What games will be available? How good is it on a modest connection speed? We’ll see as the project moves into its beta phase.